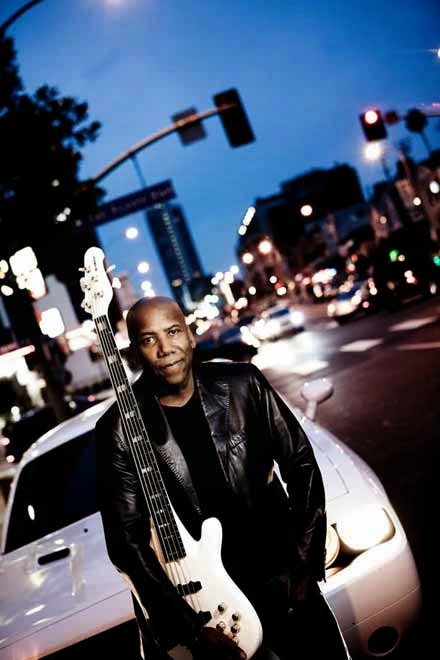 Lately it seems like everything is going Nathan East’s way. Already this year the renowned and ever-in-demand bassist has picked up five GRAMMY® awards for holding down the groove on Daft Punk’s smash hit single, “Get Lucky,” resumed his long-held station in Eric Clapton’s touring band, and just this week released his long-awaited self-titled solo debut. Then again, such touchstones also seem like par for the course for a musician whose credentials include studio sessions with myriad legends and A-listers—George Harrison, Michael Jackson, Phil Collins, B.B. 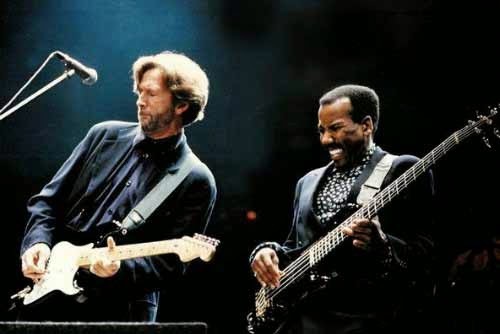 King, Anita Baker, and Lionel Richie, just to name a handful—as well as performances at some of popular music’s most storied events and stages, from mammoth all-star benefits like Live Aid and Knebworth to such fabled venues as the Budokan and the Royal Albert Hall. For the new album, East assembled an eclectic roster including Clapton, singer/songwriter Sara Bareilles, and fellow co-founder of jazz supergroup Fourplay, keyboardist Bob James. “It was pretty seamless,” says East, adding that the musicians sought to reflect the spirit of a live performance. The camaraderie among them no doubt facilitated that pursuit and, in doing so, all the more enlivened moments like the retro, coyly titled first single, “Daft Funk,” and a solemn rendition of The Beatles’ “Yesterday,” the latter featuring his 13-year-old son, Noah East, on piano. Considering you work from such a broad palette—playing jazz, rock, R&B, soul—did you have any sort of guiding objective about how you wanted this album to sound? Did you want it to reflect you in any certain way especially since it’s your first statement as a solo artist? Yeah, I was careful about making sure that although it wouldn’t be too much of a diverse statement that it would reflect a celebration of my musical tastes and friends. Are there many improvisational moments on the album? Absolutely. A lot of what happens in the studio is pretty much intuitive and instinctive of what happens on the day whether it’s before or after the record button’s pressed, but the bottom line is by having a band and doing everything live you definitely have more room for improvisation and just whatever spontaneous magic that’s going to take place. You’ve got two Stevie Wonder songs on the album [“Sir Duke” and “Overjoyed”]. Beyond just being a fan, what is it about his music or his songwriting that attracts you to his work? Honestly I’ve probably been a fan of Stevie’s music for 40 years where it’s always had a special place in my heart. His compositions and his music in general is just a fertile garden of just everything … The soil is good. The fruit is good. Everything’s good about it! The amazing thing about Stevie is every song that he writes is different. Like, it sounds like Stevie, but it’s not like the same chord changes or sound. Some writers have a particular key or a particular set of chord changes that they use, but Stevie’s just a fountain. That’s him playing harmonica on your version of “Overjoyed,” right? A lot of the people you’ve worked with—Michael Jackson, Eric Clapton, Quincy Jones, Phil Collins—are known for having strong creative instincts. It must take a certain kind of discipline on your part to be able to work with those different types of people. I’ve definitely learned a lot from working with these kinds of artists. People like Quincy and Phil Collins, these are some work ethics like you’ve never seen before, literally where you can put 14, 16, 18 hours a day into being in a studio and just working hard. I’ve learned that there are no shortcuts and people that are successful in general are hard workers. Your disposition and personality must factor in as well, knowing when you can contribute something and knowing also when it’s not a good time to do so. Does that just take experience to learn? Well, those are things that you hopefully learn early on. Music is one of those situations where nobody’s forcing you to be there, so if you can get along with folks and if you come with an attitude of contribution and an uplifting spirit people generally like being around that rather than the opposite. The more I work and the longer I’m in this business the more I realize that that’s a big part of everything as well. Have you found it useful to have learned to read music when you were a college student?A lot of musicians don’t know how to read music, and I just wonder if it’s been beneficial in your career. Absolutely. I couldn’t be more grateful for having pursued an education in music and learning how to read music. In those situations where you’re relying strictly on your sight-reading chops for an orchestral date when you’re doing a movie session and 60 pieces are in there and the notes are flying by it feels good to know that you can kind of hang tough with the rest of the gang. Does the bass still challenge you? Very much so. On a daily basis I’m challenged to come up with something that’s interesting and not boring but not overbearing. For me it’s like every song is a chance to say, “Okay, I have another chance to really get it right,” and, “What is the best thing to play for this song?” It’s a constant challenge. Do you have any sort of philosophy for playing the bass? Like, Clapton has said he approaches playing the guitar much like a samurai. He steps into the spotlight only when necessary, he uses discretion about when to take a solo, and he tries generally not to overdo anything. Do you have any comparable approach to how you play? That similar philosophy is one that I approach music with as well. I look at it as a big picture, and not just me. So lots of time I’ll take myself out of the equation and see what the big picture is trying to say and then try to determine what it is that I’m going to bring that’s going to complete that picture. Absolutely. That’s the number-one priority is serve the song, and serve the dialog and the communication and the camaraderie. After all these years how do you maintain your enthusiasm for playing music? You’ve always radiated such warmth and such love for what you do, and I just wonder how you manage to keep that going for all these years and through so many different incarnations of your career. That’s a great question. The first very obvious answer is that I’ve just been blessed with a very enjoyable cross-section of music that I have the privilege and opportunity to play. There’s not a day that I don’t wake up that I’m not thankful for the privilege of playing music. At the same time, none of the gigs that I’ve had have been gigs where I’m thinking, “I’m just doing this for the money.” Most of them I just absolutely loved the music, the people. I mean, what’s not to love? What’s not to be enthusiastic about? 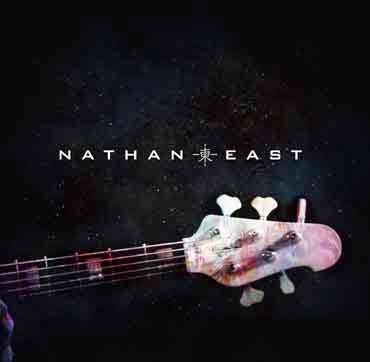 Nathan East is available now from Yamaha Entertainment Group. For more information, visit NathanEast.com.